During its passage through the geomagnetic tail, the Moon encounters the plasma sheet. Properties of plasma sheet electrons and protons, first detected at lunar distances by Explorer 35, are described. The electrons have a rapidly fluctuating non-Maxwellian energy distribution with a mean energy of several hundred electron volts and density ç 0.2 cm−3. The protons, of energy ç 1 keV, were usually detected above the instrument background when flowing towards the Earth at ç 200 km s−1. 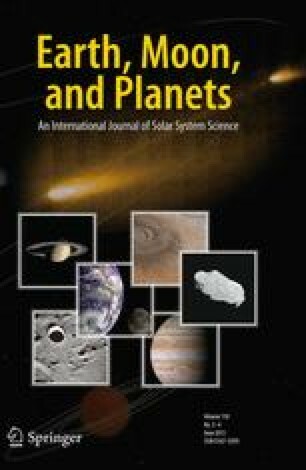 Implications for migration of grains on the lunar surface are also pointed out and it is suggested that strong terrestrial polar winds in the early history of the Earth-Moon system may have caused some erosion of the Earth-facing side of the Moon, and that gravitational shielding of interplanetary rock flux by the Earth may also be an explanation of the relative smoothness of the front side. Partly based on a paper presented at the Conference on ‘Interactions of the Interplanetary Plasma with the Modern and Ancient Moon’, sponsored by the Lunar Science Institute, Houston, Texas and held at the Lake Geneva Campus of George Williams College, Wisconsin, between September 30 and October 4, 1974.